During mid- to late summer and early autumn, large, unusually shaped, colorful caterpillars are often seen. These caterpillars, larvae of moths and butterflies, feed on leaves of various trees, shrubs, and other plants. The exact host plant or plants vary with each species of caterpillar. Most giant caterpillars are discovered when wandering across lawns, driveways, sidewalks, etc. These caterpillars are fully grown and they are on their way to pupation (transformation into adults) sites. They have finished eating and will cause little or no further plant damage. Therefore, controls are generally not recommended. Moths and butterflies develop by complete metamorphosis characterized by four distinct growth stages. The egg hatches into a larva (caterpillar) which grows and molts (sheds its skin) several times before transforming into a pupal from which a winged adult emerges later. Eggs vary in size and shape. Many are spherical while others are flattened, conical, spindle, or barrel shaped. Some are smooth while others are ornamented with ribs, pits, grooves, or networks of fine ridges. Larvae are of various shapes and sizes. A few appear treacherous with long, curving, spiky horns projecting from the body. Many have dull or bright colors with unusual looking patterns. When fully grown, most moth larvae burrow into the ground and pupate in earthen cells. Others pupate among dead leaves on the host plant or debris on the ground. Hairy species usually mix their hairs with silk, making a flimsy cocoon. Silk moth larvae spin tough paper-like silken cocoons that protect the enclosed pupae. Pupae (within cocoons or within earthen cells) are the transformation stage of butterflies and moths. Most of the large moths and butterflies discussed here spend the winter in the pupal form. If you capture one of the mature larvae in the fall, it will likely refuse to eat and may form a pupa or cocoon. It is difficult to keep these inside for the winter without subjecting them to lethal drying or heat. It is best to simply observe the caterpillar and then let it find its normal place to transform. This caterpillar is the larva of the Regal Moth, also known as the Royal Walnut Moth. The larva has a scary, frightful appearance resembling a small dragon with up to five pairs of long, curving hornlike structures over the back of its thorax with the rest of the body covered with shorter spikes. The body color ranges from deep blue-green to tan with orange spikes tipped with black. Shorter spikes are black. Though very ferocious appearing, it is quite harmless to handle. They are enormous in size, being five to six inches long and nearly ¾-inch in diameter. They feed for a period of 37 to 42 days on the leaves of hickory, walnut, butternut, pecan, ash, lilac, persimmon, sycamore, sumac and sweet gum. Larvae mature in late summer, wandering around searching for a place to burrow underground to pupate. Overwintering occurs in the pupal stage. The moth has a wingspan of five to six inches and is seen in midsummer. It has a long body covered with soft, orange and yellow hair. The forewings are gray with orange veins and yellow spots. The hindwings are primarily orange with scattered yellow patches. This caterpillar is the larvae of the Cecropia moth, also known as the Robin moth. In the early stages, larvae are black and covered with short bristles. When mature, caterpillars are about four inches long and nearly ¾-inch in diameter. Body color is green with a blue tinge and there are two pairs of orange, and up to eight pairs of yellow knob-like tubercles over the back with many smaller pale blue and yellowish-white tipped tubercles along the sides. It feeds on many trees and shrubs including wild cherry, plum, elderberry, maple, willow, boxelder, apple, birch, lilac, walnut, pecan, elm, beech, and poplar. Larva are easy to rear on any species of wild cherry. The larval period is 35 to 60 days. In the late summer or early fall, the larva spins an overwintering cocoon attached to a twig on the plant where the larva fed. The adult moth has a wingspan in excess of six inches and emerges May to July. This most beautiful moth has black eyespots on the outer tips of the forewings and a crescent-shaped spot in the center of each wing. The overall wing color is dark red-brown sprinkled with gray and pink. The body is large and covered with long, rust-red hair. Larvae reach nearly four inches in length and appear "pushed together" from the ends, making it accordion-shaped. Larvae are fat, pale green, and sparsely covered with hair which are not harmful if touched. They feed on many trees and shrubs including oak, hickory, elm, maple, birch, apple, boxelder, cherry, chestnut, willow, ash, grape, pine, and members of the rose family. The larval period is 48 to 50 days long. In late summer or early fall, the larva spins a rounded, tough, parchment-like cocoon in the tree or shrub in which it has been feeding. It overwinters in this cocoon, and emerges the following spring or summer as a very beautiful adult moth. A common giant silk moth, the male has a wingspan of nearly five inches and the antennae are large and feathery. The wing color is light brown with gray dusting on the forewing edges and vertical pink lines near the body. Each hindwing has a larger yellow eyespot in a field of dark blue to black. Small yellow eyespots occur in the center of the forewing. Caterpillars are yellow-green (sometimes tan or dark brown) and are covered with short, stiff hairs of light blue-green. The lower body half is hunter green. The spiracles or breathing holes along the sides of the body are large, bright white and rimmed in aqua and black. There are four long, sharp, deep yellow spines just behind the head and shorter, sharp spines under the hair. The head is orange-yellow with a black inverted Y in the center. Larvae feed on many trees and shrubs including spruce, pine, oak, maple, sycamore, cherry, birch, alder, elm, sweet gum, sassafras, beech, cedar, and walnut. The larval stage lasts for about 42 days after which the larva burrows down into the ground to pupate and overwinter. Adults often emerge in May or June. The female moth is bright yellow and speckled all over with red-brown freckles. Two small circles of red-brown are on each forewing and one on each hindwing. A wavy band, also of the same color, traverses the lower wing and two bands are on the forewings. In males, the forewings are almost covered with the red color except for a triangle at the tip and a small patch near the bottom. This caterpillar is the larva of the Luna Moth, also known as the Moon Moth. The larva is translucent pale green with a pale yellow line running along the lower side. It is nearly four inches long when mature. The larva feeds on many trees including alder, cherry, walnut, hickory, oak, sweet gum, birch, butternut, beech, willow, chestnut, pecan, hazelnut, and persimmon. The cocoon is usually spun on the ground among leaf litter so it is difficult to find in the winter. The moth stage is one of our most spectacular in North America. The wings are a very pale green with maroon, pink, or yellow margins. Each wing has a transparent eyespot surrounded by a ring of maroon or black. The hindwings are drawn out into long, graceful sweeping tails. The wingspan is four to six inches. This caterpillar is the larva of the Promethea Moth, also known as the Silk Moth. Larvae are smooth and pale green with a slight bluish cast. There are four prominent red-orange spikes near the head and one yellow spike near the rear. Four smaller black or blue spots are also present on each body segment. The head has two facial spots. Larvae feed on many plants including spicebush, cherry, sassafras, tuliptree, willow, poplar, sweetgum, ash, apple, pear, lilac, wild plum, birch, button bush, basswood, maple, and chokeberry. The larval period is 42 to 54 days. A compact cocoon in which the larva pupates and overwinters is wrapped inside a rolled up leaf attached to the host plant by a silken stalk. In June or July, the adult moth emerges with a wingspan of three to four inches. 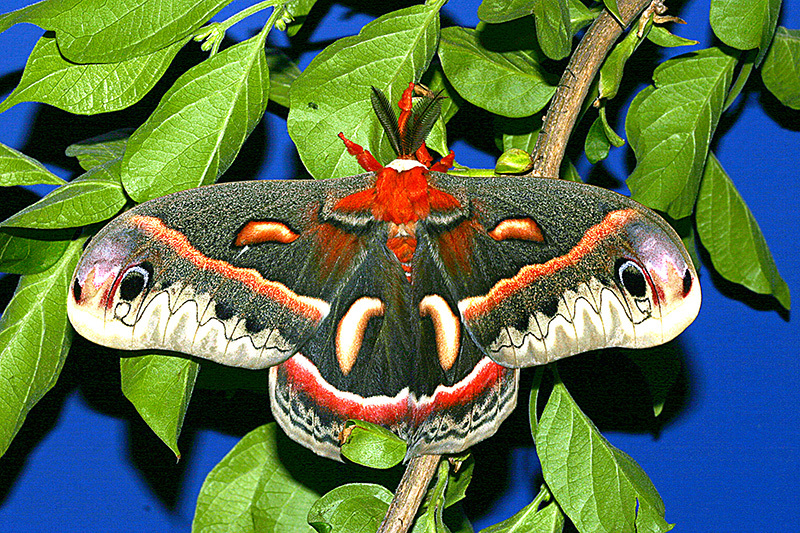 The females are larger and more brightly colored than the male moths. The female is bright red to dark brown with a tan border on both wings. The male is dark brown to black with a tan border on both wings. Both have a spot in each forewing near the margin. This moth was once considered for development of the American silk industry. 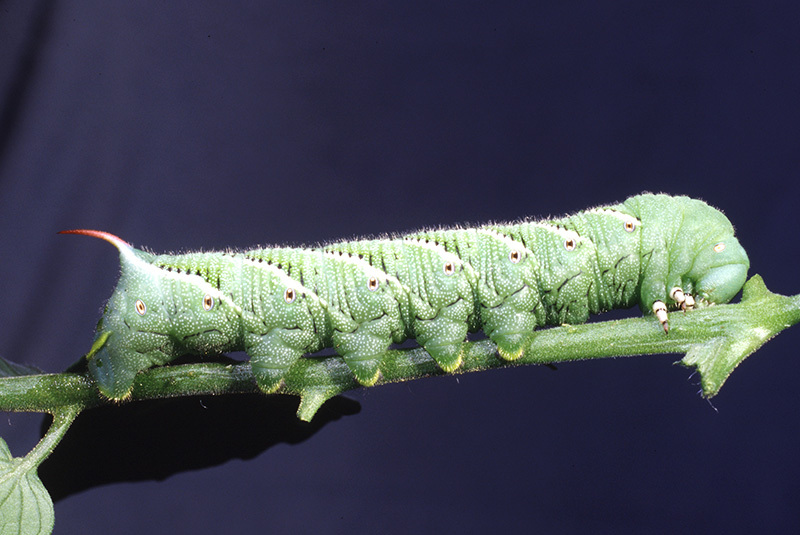 The tobacco hornworm, also known as the Carolina Sphinx Moth larva, has seven diagonal white stripes on each side of the body and a curved red horn at the rear. The tomato hornworm, also known as the Five Spotted Hawk Moth larva, has eight curved white stripes on each side of the body and a straight black horn at the rear. Both caterpillars are green, occasionally with a brown or black tinge, and will reach a length of four inches. Food plants of both larvae include tobacco, tomato, eggplant, pepper, potato, and related weeds. The larval period ranges from 28 to 36 days, after which the larva burrows into the soil three to four inches deep to pupate and overwinter. In May or June, the adult emerges. These sphinx moths are powerful fliers, and are sometimes called hawk moths or hummingbird moths because they hover while feeding on flowers. Moths are dark gray, sometimes mottled with black and light gray. Two zigzag, black lines extend across the hindwings with a black band near the border. There are five pairs of yellow spots on each side of the abdomen. The wingspan is four to five inches. A braconid wasp parasite is an important natural enemy. The white cocoons of this parasite are commonly seen attached to the larvae. The catalpaworm, also known as the Catalpa Sphinx Moth larva, occurs in two color forms. It may be a velvety black to dark green with black stripes, or it may be yellow or tan with irregular black stripes on the sides. There is a black horn at the rear. 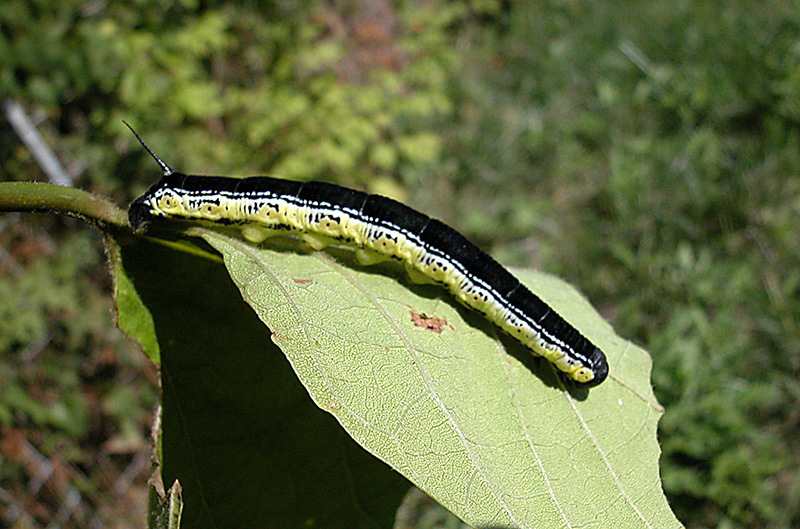 The larvae feed on catalpa tree leaves and are capable of completely defoliating a tree. There are usually two generations a year. Fully grown larvae reach a length of three inches before burrowing into the ground to pupate. Larvae are often attacked by a parasitic wasp, and few of them survive to become pupae and moths. Adult moths emerge shortly after the catalpa trees have come into full leaf. Adults are light brown to tan with a wingspan of about 3½ inches. They fly primarily at night and are seldom seen. Larvae are sometimes called parsleyworm, celeryworm, carrotworm, or American Swallowtail Butterfly larvae. Caterpillars are pale to yellowish green with irregular black cross bands that partially surround yellowish to orange spots. They feed on parsley, parsnip, celery, carrot, dill, caraway, Queen Anne's lace, and many other related plants. They are sometimes a pest of gardens and field crops. There are two or more broods a year. Larvae pupate on the host plant or on nearby structures, and may overwinter in this stage. Adult butterflies are black with the wings marked by two rows of yellow spots along the outer margins. On the hindwings there are blue spots between these two rows of yellow spots and a yellow spot tinged with orange in the inner margin of the wings. The wing span is about three inches. Larva are smooth and green with a pair of eyespots on the sides near the head. The spots are yellow to orange with blue centers and are rimmed with black. There are a pair of fleshy, odoriferous structures on the top backside of the head. Larvae usually live in a folded leaf and feed on spicebush, sassafras, sweet bay, prickly ash, and other shrubs. Larvae pupate on the host plant and overwinter in the pupal stage. There are two to three broods a year, depending on the climate. The adults emerge in late April to early May. They are often called green clouded or green spotted swallowtails since the male's hindwing has a pronounced greenish tone. Forewings are dark green or almost black with yellow marginal spots while the hindwings are bluish green with marginal spots tinted with green. There are orange spots on the hindwing margins. They are active, steady fliers and seldom alight. This larva is generally covered with fine spine-like bristles tipped with stinging hairs! The body is green with a distinctive white stripe bordered with red to purple. Fully mature larvae are often three inches long. This caterpillar should not be handled as the stinging hairs can feel like contact with stinging nettle. The sting can persist for minutes to hours and people allergic to the venom can have even more severe reactions. Larvae can be found feeding on birch, blackberry, cherry, clover, elm, hackberry, hibiscus, oak, poplar, sassafras, willow, and wisteria. It can also occur on corn and some ornamental grasses. Larvae can be found any time in the summer months. The male moths are yellow and the females are a purple-brown. When disturbed, they will raise the front wings to expose the two hind wings that have distinctive eye-spots. Adults usually fly in mid- to late June in Ohio. Adults can have wing spans of two to three inches. NOTE: Additional caterpillars can be identified by checking in a Golden Guide booklet entitled Butterflies and Moths published by Golden Press of New York; either of the Peterson Field Guides: A Field Guide to the Butterflies of Eastern North America or A Field Guide to the Moths of Eastern North America, published by Houghton Mifflin Company of Boston; or Princeton Field Guides: Caterpillars of Eastern North America, published by Princeton University Press.